British literature is literature from the United Kingdom and other countries from the Anglosphere, excluding literature of the United States, largely written in the English language. The English novel became a popular form in the 18th century, with Daniel Defoe's Robinson Crusoe (1719) and Samuel Richardson's Pamela (1740). Another very popular form was the Gothic novel (The Castle of Otranto, 1764) which led the way to Frankenstein (1818) and Dracula (1897). Tristram Shandy (1759) deserves mentions as the start of avant-la-lettre postmodern British literature. The earliest native literature of the territory of the modern United Kingdom was written in the Celtic languages of the isles. The Welsh literary tradition stretches from the 6th century. Irish poetry also represents a more or less unbroken tradition from the 6th century to the present day, with the Ulster Cycle being of particular relevance to Northern Ireland. Anglo-Saxon literature includes Beowulf, a national epic, but literature in Latin predominated among educated elites. After the Norman Conquest Anglo-Norman literature brought continental influences to the isles. English literature emerged as a recognisable entity in the late 14th century, with the rise and spread of the London dialect of Middle English. Geoffrey Chaucer is the first great identifiable individual in English literature: his Canterbury Tales remains a popular 14th-century work which readers still enjoy today. Following the introduction of the printing press into England by William Caxton in 1476, the Elizabethan era saw a great flourishing of literature, especially in the fields of poetry and drama. From this period, poet and playwright William Shakespeare stands out as arguably the most famous writer in the world. 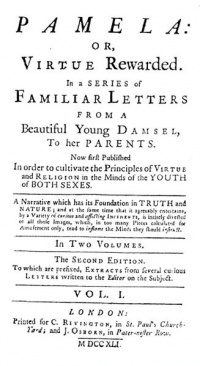 The English novel became a popular form in the 18th century, with Daniel Defoe's Robinson Crusoe (1719), Samuel Richardson's Pamela (1740) and Henry Fielding's Tom Jones (1745). After a period of decline, the poetry of Robert Burns revived interest in vernacular literature, the rhyming weavers of Ulster being especially influenced by literature in Scots from Scotland. The following two centuries continued a huge outpouring of literary production. In the early 19th century, the Romantic period showed a flowering of poetry comparable with the Renaissance two hundred years earlier, with such poets as William Blake, William Wordsworth, John Keats, and Lord Byron. The Victorian period was the golden age of the realistic English novel, represented by Jane Austen, the Brontë sisters (Charlotte, Emily and Anne), Charles Dickens, William Thackeray, George Eliot, and Thomas Hardy. The Celtic Revival stimulated new appreciation of traditional Irish literature, however, with the independence of the Irish Free State, Irish literature came to be seen as more clearly separate from the strains of British literature. The Scottish Renaissance of the early 20th century brought modernism to Scottish literature as well as an interest in new forms in the literatures of Scottish Gaelic and Scots. Other well-known novelists include Arthur Conan Doyle, D. H. Lawrence, George Orwell, Salman Rushdie, Mary Shelley, J. R. R. Tolkien, Virginia Woolf and J.K. Rowling. Important poets include Elizabeth Barrett Browning, T. S. Eliot, Ted Hughes, John Milton, Alfred Tennyson, Rudyard Kipling, Alexander Pope, and Dylan Thomas. Unless indicated otherwise, the text in this article is either based on Wikipedia article "British literature" or another language Wikipedia page thereof used under the terms of the GNU Free Documentation License; or on original research by Jahsonic and friends. See Art and Popular Culture's copyright notice. This page was last modified 21:52, 25 October 2018.